much more meat on the bone than any competitor without these credentials. If the standard now mandates certified technicians, and if the owner overlooks this, he potentially increases his liability profile. Suddenly, you are adding a valuable service by remaining an informed and trusted professional who leads customers through the code compliance process with knowledge and authority. Though this, the NFPA standard will have 'grown teeth' and you would be prepared with the solution in your market place. Your audience would include property owners, managers, code officials, fire protection professionals and insurers. The industry associations can be tasked with public communications and with developing additional training topics and venues. These are assets that we need to further develop for these tasks, but the talent is already in place. You would be delivering a superior product. Consistency is the key to training and although many of us learned the ropes through trial and error, the use of mentors and certified training programs certainly accelerates the process, saves valuable time, ultimately saves money and helps avoid potentially catastrophic errors. Your company will be armed with the right information and the ability to deliver more consistent results. Our educational programs are designed to produce a much more uniform standard of performance for our technicians. Your position would now include a foundation built upon mandated standards plus certified training and continuing education, the hallmarks of a professional company. Now, if faced with a deposition, you can state your proactive approach to technical education. You have a useful, defensible platform from which you can prove the level of independent instruction and uniform training provided for your techs. You would help raise the overall bar of excellence in our industry. We've all been witnessing this over the years with various certification and accreditation programs. It gets positive results and we can only hope to keep building on what we've established. In my opinion, the drive for standard revision and technical certification is long overdue and entirely necessary for the fire protection segment of this business. Within Reach We can do this. Currently, IDEA has, or is in the process of certifying around 1,250 techs for rolling steel fire doors. There is viable pushback to this proposed change to the standard that points out the inadequate quantity of trained technicians in the field available to handle the demand this would create. Now we're getting somewhere. That's a great problem to have, and our association is poised to tackle it head on. If the NFPA 80 language is successfully revised, it will still take a couple of years to be published and effective as a standard – possibly in the 2022 edition. Between now and that time, IDEA has the ability to certify many hundreds, if not thousands of technicians in preparation for this event. The advertising capacity through our industry publications reaches virtually all of the 4,500+ door companies in the U.S., so we are very confident that we can get the word out. As your IDA representative to the NFPA 80 committee, I can tell you that this seat needs the strong, unified voice of our association to help move the motion forward to a successful vote. As a voting DASMA seat, I can tell you that this discussion is an upcoming line item on our agenda and, by the numerous discussions I have had with manufacturers of fire protection products and other industry leaders, I believe they will support this effort and that we will reach a positive consensus, allowing us add the weight of DASMA with our own to approach the NFPA 80 committee with a unified voice. This was attempted several years ago, but failed. This time, we need to make it happen for the benefit of our industry, the community of building owners and the public overall. We believe this discussion is absolutely necessary and has substantial, measurable value for our members. 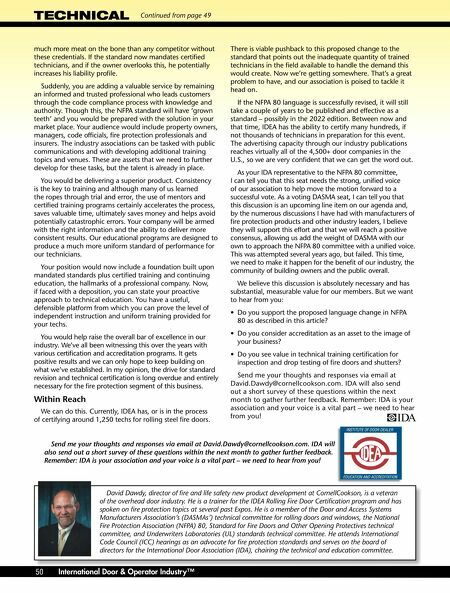 But we want to hear from you: • Do you support the proposed language change in NFPA 80 as described in this article? • Do you consider accreditation as an asset to the image of your business? • Do you see value in technical training certification for inspection and drop testing of fire doors and shutters? Send me your thoughts and responses via email at out a short survey of these questions within the next month to gather further feedback. Remember: IDA is your association and your voice is a vital part – we need to hear from you! David Dawdy, director of fire and life safety new product development at CornellCookson, is a veteran of the overhead door industry. He is a trainer for the IDEA Rolling Fire Door Certification program and has spoken on fire protection topics at several past Expos. 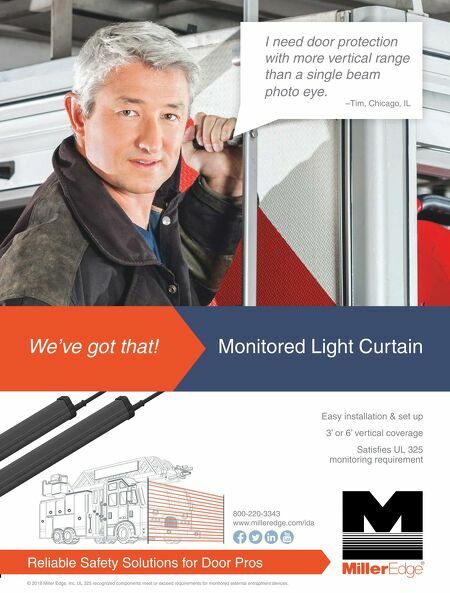 He is a member of the Door and Access Systems Manufacturers Association's (DASMAs') technical committee for rolling doors and windows, the National Fire Protection Association (NFPA) 80, Standard for Fire Doors and Other Opening Protectives technical committee, and Underwriters Laboratories (UL) standards technical committee. He attends International Code Council (ICC) hearings as an advocate for fire protection standards and serves on the board of directors for the International Door Association (IDA), chairing the technical and education committee. TECHNICAL Continued from page 49 50 International Door & Operator Industry™ Send me your thoughts and r also send out a short survey of these questions within the next month to gather further feedback. Remember: IDA is your association and your voice is a vital part – we need to hear from you!